Observing the campsite house rules is our common goal in order to enable our guests to rest and recreate. Before occupying the accommodation, guests arriving at the campsite must register individually and present their personal documents to our employees for registration purposes. The electronic registration takes place at the campsite according to the description in the automatically generated e-mail received before arrival. For citizens from outside the EEC (European Union, Liechtenstein, Norway, Iceland and Switzerland), the data to be provided is determined by the legal regulations (Act No. II of 2007 and Government Decree 114/2007). Such data must be forwarded by the Campsite to the regional directorate or office of the Immigration and Asylum Office. Registered camping guests will receive a wristband which they must wear during their stay at the campsite (in order to simplify the entry to the campsite). After registration, vehicles receive a vehicle sticker which must be affixed to the windscreen in a clearly visible place. The vehicle sticker entitles you to drive on the camping site. We ask our guests to park the vehicles only on their own plot, as well as in the marked parking areas at the houses. At the campsite, the rules of the Road Traffic Regulations apply. Driving under the influence of alcohol is PROHIBITED. The maximum speed limit for motor vehicles is 5 km/h on the camping grounds. The loss or damage of the wristband or the vehicle sticker will result in the payment of an extra fee. The extra fee amounts to 2.000,- HUF. Accommodation can be occupied by guests from 3 pm on the day of arrival. On the day of departure, the holiday houses and mobile homes can be used until 10 am, while pitches and tent places until 12 o’clock. Before leaving the campsite, guests must check out at the reception and pay the fees and for the services they had used. When checking out, the rooms will be taken over and the safety deposit (see later) will be refunded. After prior agreement, arrival and departure at a different time than indicated is possible depending on the respective occupancy for an additional charge. The amount of the additional charge is determined according to the respective price list of the campsite. For each longer stay we add one extra day. The location for the installation of camping equipment and the parking place of the guests’ vehicles is specified by the reception service of the camping, depending on the occupancy and the available camping units. Camping is only allowed in the designated area. The camping location can only be changed with the consent of the reception service. Please consider the opening hours of the reception and the gate service during your holiday: Gate service: open from 27 April to 30 September 0-24, 24/7, in this time pedestrian traffic is possible. The entrance gate is closed from 11 pm until 6 am, during this time the traffic of vehicles is only possible in justified cases. The afternoon siesta is between 1 and 3 o’clock, the nighttime peace lasts from 11 pm until 06 am. During these times we ask you to remain quiet in order to allow the undisturbed rest of the other guests. Friends and relatives who come to the campsite as visitors must buy visitor tickets (the price of which is determined by the respective price list of the campsite) enabling them to use the services of the campsite until 8 pm at the latest. Visitors can only park at the designated parking places. Persons under 18 years can only stay at the campsite under the supervision of their parents or relatives. Minors are not allowed to register independently. In the case of group holidays, the accompanying teachers and adult group leaders are responsible for the underage participants. The campsite assumes no responsibility for minors who book online and arrive without indicating their age. Persons under 18 years can only use the water vehicles under parental supervision; playground equipment can only be used up to 50 kg of weight or by children under 14 years of age. The prices not referred to in the House Rules are indicated in the respective price list of the camping which can be found at the reception. In the event of deviations, the provisions of the price list are to be considered decisive. Only animals of a peaceful nature and non-frightening appearance can be brought into the camping site for an additional charge. The charges for pets are included in the respective price list of the campsite. Please take the vaccination certificate of your pets with you since they are to be presented on request. Leashes are compulsory. Pets are NOT allowed to enter the reception, the holiday houses and mobile homes, the community rooms and restaurants, playgrounds, the beach, and they can not be taken into Lake Balaton and into the swimming pools. Animals can only be bathed or dipped at the places marked with a pictogram. Pet owners are obliged to keep clean after their animals. Guests are obliged to check the equipment of the accommodation units. If deviations or defects are detected, they must be reported immediately. Later complaints will not be accepted. It is PROHIBITED to damage the accommodation, furnishing and equipment items in the area of the campsite. Intentional damage or theft of furnishings always results in the on-site payment of compensation and/or reporting the offense. Arbitrary technical interventions of any kind in the furnishings and equipment of the houses, as well as the rearrangement of the rooms are strictly forbidden. The campsite assumes no responsibility for the results of such actions. We ask you to use the equipment only inside the campsite area. When cooking and grilling in the open, we ask you to bring the necessary objects back into the houses after their use. If items belonging to the accommodation unit are removed from the object, please return them at the time of checking out at the latest. Compensation must be paid for the missing furnishings and equipment items. Guests are free to use their electrical and communal facilities and equipment. All are facilities and equipment must be used properly and as intended. It is forbidden to use electrical equipment (stoves, refrigerators, air conditioners, etc.) that does not comply with the valid standards. The camping assumes no responsibility for damage resulting from improper use or from non-standard equipment. There is a fire ban throughout the entire campsite. The use of open fire is PROHIBITED. Making a fire and cooking on open fire is only allowed at the designated places with the observation of the official fire protection rules and with the prior consent of the campsite manager. We do NOT assume any responsibility for valuable items lost at the campsite! Your valuables are to be kept in the safe at the reception. The safe is only accessible during the opening hours of the reception. Don’t forget to protect your valuables and keep the doors and windows of your accommodation unit locked. The campsite assumes NO responsibility for damage caused by natural disasters or storms (hail, falling trees and branches, etc.) and for damage caused by fire, infections, diseases and terrorist attacks. Connecting to and disconnecting from electrical supply systems (distribution cabinets) can only be carried out by the person authorized by the campsite. The Fire Protection Regulations of the campsite and the evacuation plan are deposited at the reception. The latter can also be found in the individual residential units. First aid is available at the reception and at the first aid stations. If you need medical care because of an accident, please inform the campsite personnel. The use of the services of the campsite happens at each person’s own risk. We ask you to pay special attention to the intended use, as well as to the fact that children under 14 years can only use some devices and facilities under parental supervision. The rules concerning the use of the swimming pool and the slide are displayed next to the facilities. Our camping site is located in a highly sensitive area of Lake Balaton. Protecting the environment and the nature is the duty of the visitors. It is PROHIBITED to throw away or leave behind litter on the camping grounds. We ask you to keep your accommodation and its surroundings clean and tidy. Please think of the next guests and leave your accommodation in clean condition on departure. We ask you to deposit waste in the designated collecting containers. Labels corresponding to selective waste collection are to be found on containers and it is NOT permitted to place waste of any other kind in them. For information about the disposal of hazardous waste (e.g. : used batteries, dry cells, etc.) refer to the reception. If you notice oil or gasoline leaking from your vehicle, you must report it at the reception immediately. We kindly ask you to protect the plants and bushes at the campsite. Do not break or cut off their twigs and branches (if they are disturbing you, please let the reception know) and do not step on saplings. Pay attention to the plants standing at the edge of the parking lot when parking. Please do not fasten clotheslines to trees and do NOT tie the fixing ropes of tent awnings to the trees. It is STRICTLY PROHIBITED to drive nails into trees and to pour food leftovers and harmful materials onto the vegetation. Digging holes and pits, even if temporarily, is strictly forbidden too. The protection of the sensitive nature is especially important at the beach and in the water. Bathers use great amounts of sun cream which means a tremendous burden for the organisms living in Lake Balaton. Please try to make every effort to reduce the amount of sun cream discharged into the water. This way you can contribute to the improvement of the lake’s water quality. Guests with trailers must drain the sewage at the designated collection points. Bather can use the beach at their own responsibility. The strip within 10 meters along the water’s edge is considered beach area, therefore guests are not allowed to set up their trailers and tents in this area. Feeding swans and ducks is STRICTLY FORBIDDEN due to hygiene reasons. There are 5 cylindrical buoys of 0.5×0.5 m marking the boundaries of the bathing area. Deep water starts at a water depth of 1.20 m and is highlighted by 3 buoys with depth measurements. It is forbidden to bring pets into the common areas, to the waterfront, into the water, to the playground and the sports fields, and it is also forbidden to leave animals alone on the campsite, even if they are on the leash. Fishing in the beach area is prohibited. Children under 6 years and children under 12 years who cannot swim may only stay in the water under the direct supervision of adults. Children under 10 years of age are not allowed to stay in the beach area on their own. Parents and the accompanying adults are responsible for the children. The storm warning service is in operation from 1 April to 31 October. Its functions are described on a separate sign. Everyone is obliged to observe the signals and to act accordingly. No vehicles may enter the beach area. In the sunbathing area on the shore, the usual activities (sunbathing, sports and games) may be performed. Disturbing activities and activities harmful for the environment are prohibited. During the stay at the beach, everyone is obliged to take care of their own physical integrity, as well as that of other bathers. Jumping off the rocks of the shore’s protective structure is forbidden and dangerous. Only materials related to beach visits and common on the beach can be brought into the area of the resort without disturbing other bathers and polluting or damaging the environment. under the influence of alcohol or drugs. The guests of the campsite are constantly informed about the quality of the water. The water quality is controlled by: Veszprém Megyei Kormányhivatal Népegészségügyi Főosztály Laboratóriumi Decentrum /External Laboratory Centre of the Public Health Department of the Veszprém County Government Office/, 8200 Veszprém, József A. u. 36. The sanitary facilities of the beach resort are located inside the water block of the campsite. The water blocks are continuously open, continuously cleaned and disinfected. These activities are carried out by the personnel in compliance with the relevant regulations. The water fittings of the water block run with drinking water. Sewage and precipitation water is removed via the connected sewerage system. The appropriate preparation and ongoing maintenance of the beach resort is carried out by the campsite employees. For the collection of selective and mixed waste there are waste containers is use. Their regular disinfection is carried out in accordance with the valid regulations. All litter and waste is to be deposited in these containers. Waste is removed once a week in the pre-season and at least twice a week in the peak season on the basis of the contract concluded with the service provider. Before the season, the waterbed is checked by the camping personnel. During operating periods, a rescue service is available at the beach resort on contractual basis by the Hungarian Water Rescue Service (Vízimentők Magyarországi Szakszolgálata, 8230 Balatonfüred, Zákonyi F. u. 2., Tel. : +36 30 383 8383). Locations for first aid: reception, gate and water rescue service. First aid kits are available at the first aid stations. Further medical services can be reached free of charge by telephone from the first aid locations. The telephone numbers of emergency services are displayed in a well visible way. Guests are responsible for themselves when swimming, staying in the water and in the sun, provided that the physical integrity, health and the recreation of others may not be disturbed or endangered. At the camping site, fishing is only allowed on the designated spot. The place approved for fishing is determined by the campsite manager. At the reception of the campsite, more information can be obtained about the designated fishing spot. The rules of angling are included in the Fishing Rules of Lake Balaton which can be found on the website of the Siófok Angling Association. In 2018, the fishing regulations of Camping Mirabella are as follows: angling is possible from 27 April to 15 June and from 01 September to 30 September. The valid angling licence must be presented upon request of the campsite manager. The fishing activity may not disturb the recreation of the other guests. The angler is obliged to keep the fishing spot clean and to leave it in a clean state after finishing the activity. It is not allowed to clean fish on the shore and in the water. On the shore, cleaning is only allowed at the spot designated for this. It is prohibited to leave any garbage, residues of food and beverages, fishing bait or other waste at the fishing place. In case there is no place of waste deposit available at the water’s edge, the angler must take away the waste when leaving the fishing place and dispose it properly. When establishing and maintaining an angling place, it is prohibited to cut or remove the plants in the water and on the shore beyond the absolutely necessary extent or the extent determined in the local fishing rules and it is prohibited to dismantle the installations on the shore. If there is no public lighting available at the place, the angler is obliged to illuminate the fishing spot after dark in an uninterrupted and well recognizable way. Smoking is only allowed in the designated places. Please do not smoke in the holiday houses and mobile homes, in the common rooms and at the reception. Photographs and video footage can only be taken or recorded at the campsite if the persons depicted on them have given their consent thereto. We would like to draw the attention of all guests to comply with the relevant legal regulations. We inform you that the representatives of the campsite are entitled to take pictures and record audio footage at the events and happenings organized at the camping facility. These persons are authorized to perform this task so that the resulting material can be used for marketing purposes. We attempt to carry out the activity in a way that persons shall not or shall hardly be recognizable and identifiable. However, we cannot avoid that completely. Therefore, simultaneously to the acceptance of the house rules we assume that you do not express any objections against such photos to be taken. Of course, you can prohibit the further use of the photographs depicting you as soon as they are created or when they are used (in this case they will be removed or made unrecognizable by technical means). Please note that the use of drones and other remote-controlled aircraft is not permitted at the campsite and in its “airspace”. Medical emergency service is available in the town Siófok. At the reception you can obtain more information about that. Our colleagues are there to help you with any problems that may arise. First aid kits are available at the reception, at the gate service, at the swimming pool and at the water rescue service. The free-of-charge emergency telephone number is: 112. The violation of the ordinary order of camping and its written and unwritten rules. Activities that are disturbing for others (as a sight, in appearance or as noise). The disturbance of rest periods, the violation of the vehicle ban. Taking objects or creatures into the campsite which may endanger the physical integrity of others or may be disturbing for holidaymakers or for the public taste. The placement of flags, emblems or other objects which would insult certain nations or persons. It is forbidden to wash cars, change engine oil and carry out similar activities at the campsite without the permission of the campsite management. Guests can use our safe service at the reception of the campsite for free. Evidently, the campsite assumes full responsibility for the items deposited there. The campsite cannot take any responsibility for valuables stored in the individual accommodation units. All staff members of the campsites are entitled to check compliance with the House Rules and make the guests aware of them. 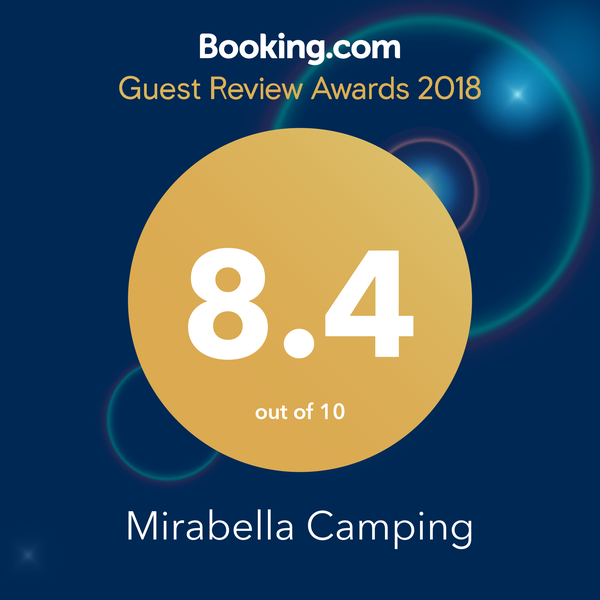 If you wish to complain about a service provided by the campsite or about the behaviour of other camping guests, you can do so personally at reception by entering your name in the customer’s book or by sending an e-mail to reservation@mirabellacamping.hu. The campsite manager can withdraw the permit to stay at the campsite from persons who violate the campsite rules and after settling the bill they will be requested to leave. Please contribute to the good reputation of our camping site as a place of peace and recreation where all guests can feel good by observing the above rules.